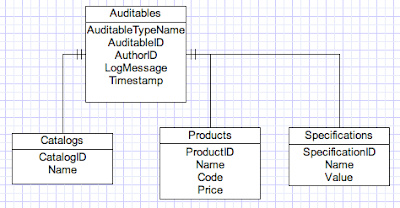 Here is a sample UML class diagram of the situation that posed me the OO design dilemma a few days ago. The Electronic Items catalog has many Televisions. The Sony Televisions come with different specifications, such as refresh rate of 240 Hz, 120 Hz and 60 Hz. However, the 240 Hz ones also comes in different colors - Black and Grey. Now, a store manager needs to see the recent changes across all catalogs, such as electronic items, musical instruments and so on. So, if someone added a new Sony 240 Hz color of Dark Black or removed the Grey one, the store manager needs to see this. However, a department manager may need to see changes at all levels, for example whenever one of her Catalog, Product, Specification or its Property is changed. So, if she needs to see all changes under Sony Television, you know, she needs to see changes in the name and value of underlying specifications and their properties as well as changes at the higher level, say, the price. 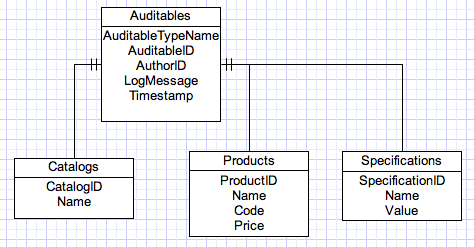 Now, given this schema, if you need to find out the latest 50 Log Messages with Author and Associated objects for the Electronics Catalog, how would you write a simple query? Because it will only produce the audit logs for the Catalog Object, whereas we are expecting to see all the recent audits for this Catalog and underlying products down to the Specification Property level. Looks like the Auditable class and corresponding design doesn’t work well for this situation. So, what is a possible solution? 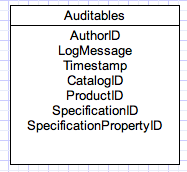 With such a schema, we need to ensure if the Audit Log corresponds to a SpecificationProperty, we put references to all its higher level objects. So, the query will be simple. With this assumption, the following query will be able to fetch all audit logs for Catalog and its descendants. However, it has its downsides as well. The Auditables is no longer a general purpose Auditable. If we add a new type of Auditable, we cannot use it unless we alter its properties! High Coupling! Less Reuse. Also, a lot of if-else will be required to show the Audit logs, as it can belong to multiple parents! How would you solve this design dilemma? Comments welcome!